The dance floor is the heart of your event. But when throwing a party, it’s a common fear that the dance floor won’t be packed. Sadly, there’s a number of things that can stop that heart from beating, and the fun stops along with it. Fortunately Bizar Entertainment is here to show you how to keep the party alive and strong. You’ve probably seen this a million times (we know we have): the music’s thumping, but no one’s out bumping. Everyone’s too timid to be the first to get their groove on, so the dance floor’s a ghost town. Wall-to- wall wallflowers are no way to keep the event thriving. Here’s the good news: if you keep a few simple things in mind, you can avoid a lifeless dance floor and keep your event jumping. Now, here are some awesome ways to keep the groove alive. Unless you’ve got a dance floor full of Beyonces, complicated moves will be beyond most people’s abilities. 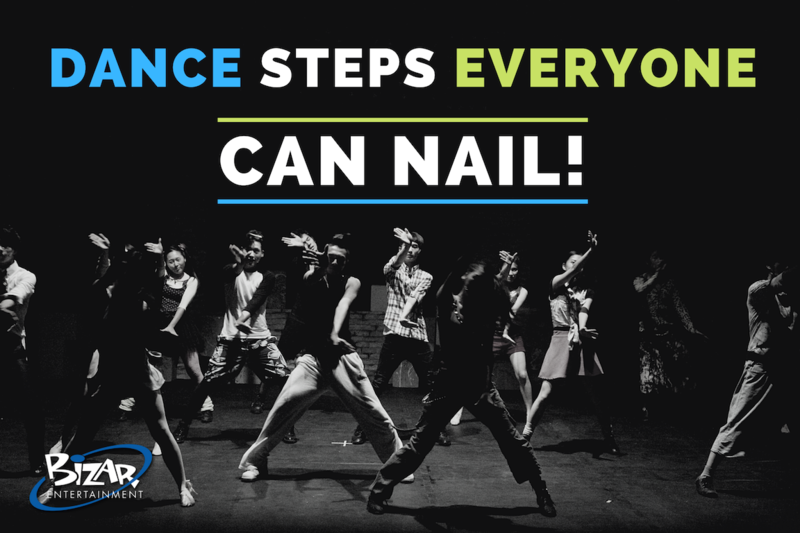 Introduce some easy-to-execute dance steps so that everyone can get moving to the beat and have a great time. I’m a huge fan of the movie Hitch. In it, Kevin James promises he’s an awesome dancer—but then, when he shows his moves off to Will Smith…well, just watch. EmCees and interactive dancers can get the floor packed and moving. The Bizar dancers are experts at providing guidance and encouragement. Hey, everyone needs a Will Smith. Sometimes people are afraid to be the first, or the only, dancer on the floor–they just need a nudge. With the right DJ, emcee, auctioneer or other leader offering inspiration, you can light a fire and fill the floor. This is where it is critical to have a professional in your corner. They know how to read a room and always have a couple of crowd pleasers in their back pockets. Introducing some humor on the dance floor can amp up the fun, and help the more nervous dancers loosen up. Moves like the Shopping Cart, the Sprinkler, the Typewriter are great laugh -makers and icebreakers. But don’t forget the host needs to have fun too! If you aren’t dancing, then no one will take the first step. You set the tone for your event. Make sure the dance floor at your next event is lively and not lifeless—get in touch with Bizar Entertainment. We’ve been at our share of weddings, bar/bat mitzvahs, corporate parties, charity galas and other events, so we know what it takes to make it a success. Contact us today to discuss packages, pricing and packed dance floors.